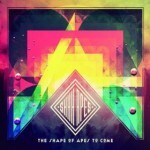 Share the post "Album review: SHHH…APES! – The Shape of Apes to Come"
Shhh…Apes! is a welsh combo steered by their effervescent founder member Mark Foley, who don’t so much compose songs, as paint aural landscape and populate them with a subtly crafted mix of harmonies, percussion and electronics. This 5 track EP/CD is a beautifully crafted ambient album full of angelic harmonies that float over slowly evolving mood pieces. The 5 tracks incorporate everything from subtle instrumentation and nuanced tempo changes to pregnant pauses that add to the dynamics. And dynamics are everything on an album that straddles lounge music, filmic landscapes and early Pink Floyd progressions. Shhh…Apes! manage to balance the polar opposites of intricately layered production with a big musical vista populated by moments of inspired spontaneity. ‘The Shape of Apes to Come’ is a coherent, linear journey which opens with the phased fractured rhythms and ascending harmonies of ‘Painkiller’ and ultimately resolves itself on retro sounding, farfisa led ‘Angels In the Ground’, full of pristine harmonies, tremolo twang and Francesca Dimech’s mariachi trumpet. The emphasis is always on the vocal duet of Mark Foley and Lianne Francis, as the track gathers momentum with a subtle tempo change and leads to the very catchy titular chorus. It’s the moment when all the various parts of the project coalesce gloriously in a climatic finish that is over all too soon. The musical filling in the sandwich is equally good. The distant guitar chimes and sonorous horns on the slowly evolving instrumental opening of ‘I Am Thin’ owes much to the Swedish electro combo The Knife, before the track gives way to trad folk style harmony vocals over a gently voiced piano. The pauses between the vocals give the song real presence, before a slide guitar figure leads into a gentle percussive outro. ‘Fall’ is another slowly evolving ensemble piece, punctuated by Stuart Michel’s doctored guitar, driven by Andrew Plain’s extravagant cymbal splashes and topped by peerless harmonies. Initially it’s reminiscent of early Pink Floyd, before it briefly explodes into electric distortion only to return to the same progression. ‘Three Horses’ is simply superb, flying on the back of a startling harmony led intro, but anchored by instrumental parts that could have come from Floyd’s ‘Ummagumma’. The band once again transform a hatful of influences to their own ends, as a folky intro is imbued with a proggy ambient feel, before a final catalytic tempo change leads the album to its subtle resolution. This entry was posted in ALBUM REVIEWS, ALBUM REVIEWS (Mobile), All Posts and tagged ambient, Andrew Plain, Blackheart, Francesca Dimech, Lianne Francis, Pink Floyd, Portishead, review, Shhh...Apes!, Stuart Michel, The Knife, The Shape of Apes to Come. Bookmark the permalink.